Pinball FX2 developer Zen Studios teased a Valve themed announcement last week, and today we finally know what they are up to. Pinball FX2 will be getting an official Portal themed table towards the end of May or beginning of June. While it's not exactly Portal 3, it's definitely an amusing and detailed return to the Portal universe crafted by developers who are clearly fans of the series. 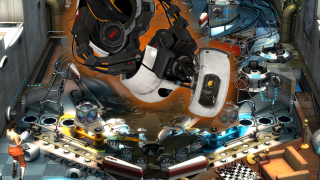 Watch the video above for our hands-on look at the upcoming Portal table for Pinball FX2. For those of you unfamiliar with Pinball FX2, it's a free pinball game on Steam that sells individual tables as DLC. Tables can be demo'd briefly, but eventually need to be purchased if you want to play them for an extended period of time. Zen Studios has done many licensed and themed tables in the past, but this is the first time the developer has worked with Valve. The level of detail on the Portal table is impressive, and makes me hope that this won't be the end of Zen Studios' partnership with Valve.